A detailed British map of China. Detail includes provinces, cities, towns, rivers, mountain, and some other topography. 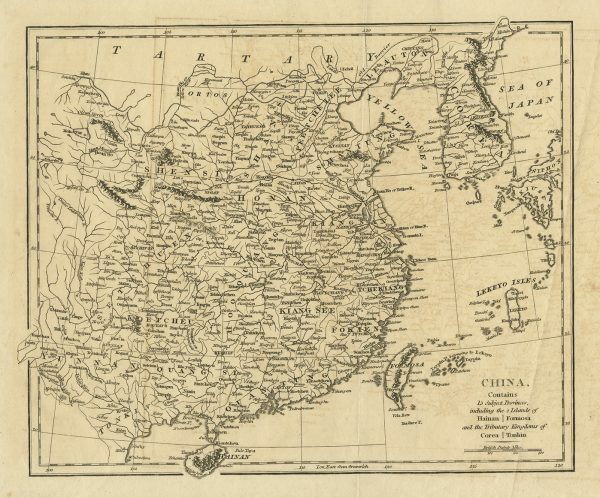 With precise engraving, the map is decorative as well as historically interesting. Extending from Corea and the Sea of Japan and Tartary in the North to Teypin Is. Belongin to I. Ekeyo, Formosa, Hainan, Tonkin and Yunnan Province. Hong Kong not yet named. By Robert Wilkinson, who was active in London as a cartographic publisher from 1785 to 1825. He produced a number of nice works, including a General Atlas and a re-issuance of Bowen & Kitchen’s English Atlas, along with excellent large format separate maps. Measures: 272 x 227 mm.